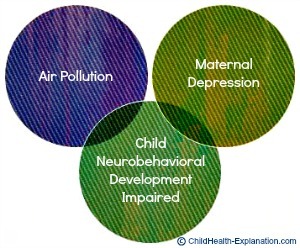 Coexistence of air pollution and maternal depression during pregnancy impedes infant’s brain growth and leads to childhood behavioral problems; poor attention, anxiety, impaired peer relationships, depression, defiance, aggression and delinquency. Detrimental effects of parents’ disturbed psycho-social well being on child’s emotional health are well established. Depressed parents are unable to cope the stress of parenting. 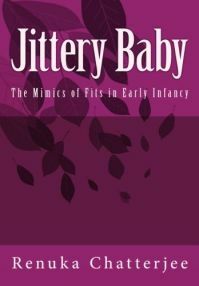 Consequently their children also suffer undue anxiety before and after their birth, experience emotional upheaval and present with disturbed social behavior right from infancy and preschool years. Besides several others, polycyclic aromatic hydrocarbons (PAHs), dioxin and lead are known common toxic air pollutants. They cause inflammatory and oxidative stress. Mother’s exposure to air pollution jeopardizes brain growth and psychosocial development of her children. The combined effect of maternal depression and prenatal exposure to PAHs potentiates ill effect of each on children’s neurobehavioral development concludes the study, "Prenatal Exposure to Air Pollution, Maternal Psychological Distress, and Child Behavior" published in Pediatrics. The results of this study could explain rising school related problems among children, which can’t be attributed to their socio-economic status. PAHs are air pollutants generated by combustion; fuel exhaust, coal fumes and so on. Their levels are found to be particularly high in sidestream tobacco smoke - 10 fold higher as compared to the mainstream. PAHs along with fine particulate air pollutants cause inﬂammatory effect that injures normal brain development. Moreover, nicotine from tobacco is also believed to alter prefrontal cortex maturation. Exposure to second hand smoke during early development therefore impedes brain growth and nerve network modulation, which has obvious implications on cognitive development, stress response, self-regulation and social skills development that persist through adulthood. Radiological evidence of inflammatory damage caused on yet developing brain has been demonstrated by magnetic resonance imaging (MRI) - seen as areas of increased intensity. The results of the study, "Prenatal Tobacco Exposure and Brain Morphology: A Prospective Study in Young Children", showed that children who were exposed to secondhand smoke throughout the pregnancy had smaller total brain volumes and smaller cortical gray matter volumes on magnetic resonance imaging (MRI) at 6-8 years of age. 2. Prenatal Tobacco Exposure and Brain Morphology: A Prospective Study in Young Children: El Marroun H, Schmidt MN, Franken IH, Jaddoe VW, Hofman A, van der Lugt A, Verhulst FC, Tiemeier H, White T; Neuropsychopharmacology, 2013 Oct 07 doi: 10.1038/npp.2013.273.